Every patient is unique, and the evolving field of precision medicine aims to ensure the delivery of the right treatment to the right patient at the right time. In an era of rapid advances in biomedicine and enhanced understanding of the genetic basis of disease, health care providers increasingly have access to advanced technologies that may identify molecular variations specific to an individual patient, which subsequently can be targeted for treatment. 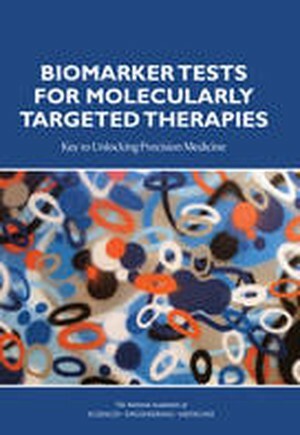 Known as biomarker tests for molecularly targeted therapies, these complex tests have the potential to enable the selection of the most beneficial treatment (and also to identify treatments that may be harmful or ineffective) for the molecular underpinnings of an individual patienta (TM)s disease. Such tests are key to unlocking the promise of precision medicine. Biomarker tests for molecularly targeted therapies represent a crucial area of focus for developing methods that could later be applicable to other areas of precision medicine. The appropriate regulatory oversight of these tests is required to ensure that they are accurate, reliable, properly validated, and appropriately implemented in clinical practice. Moreover, common evidentiary standards for assessing the beneficial impact of biomarker-guided therapy selection on patient outcomes, as well as the effective collection and sharing of information related to those outcomes, are urgently needed to better inform clinical decision making. Biomarker Tests of Molecularly Targeted Therapies examines opportunities for and challenges to the use of biomarker tests to select optimal therapy and offers recommendations to accelerate progress in this field. This report explores regulatory issues, reimbursement issues, and clinical practice issues related to the clinical development and use of biomarker tests for targeting therapies to patients. Properly validated, appropriately implemented biomarker tests hold the potential to enhance patient care and improve outcomes, and therefore addressing the challenges facing such tests is critical.